Came across this on Microcontrollershop.com. I may give this a try. Anyone try installing Retrobsd on it yet? Looks like a decent development board, and not too expensive. It would be great to have a variant of this board, adapted for pic32mz. The configuration for RetroBSD kernel should be easy to create. Existing Duinomite config is a good starting point. Unfortunately, Ethernet port is currently useless, as we do not have TCP/IP stack in RetroBSD. It looks like that board has been out for a while (since 2011). Maybe Olimex has some new pic32mz offerings in the works. I'm sure the TCP/IP stack will be developed eventually. And does the Atmel 32-bit series have enough RAM to run RetroBSD? It looks like they're under 128k of SRAM. Do you mean Atmel AVR32 family, like AT32UC3A4256? Quite interesting chip. It would be great if somebody ported RetroBSD to it. That's definitely the one, the AVR32 family w/ 128k RAM. I didn't know if anyone was working on a port for the AVR32. I've been getting started with microcontroller programming, and I have a couple of PIC development boards, though the micro used is the PIC 16f877a. I just had development boards I've bought years ago, but never used. That's a good chip to get a feel for the PIC micro.... the PIC32 family is really just a more powerful version of the earlier PIC chips, like the 16F. For example, there are certain programming aspects particular to the PIC, that are still the same, like setting the tristate and port registers. Once I get the feel for programming these older pics, I can move up to the PIC32. It would be interesting to have a way to manipulate the TRIS and PORT registers from a shell script or Python script with RetroBSD. Maybe there are special files in /dev that represent the TRISx and PORTx register functions in RetroBSD? Exactly! There is a set of /dev/conf* and /dev/port* devices, which allow to control GPIO signals from shell scripts. For details see http://retrobsd.org/wiki/doku.php/doc/gpio. # Set signals RE5, RE6 and RE7 as output. Are there any really good pic32mz boards out yet? Olimex is going to come out with one (with ethernet), and MikroElectronika has a decent set of development boards, but no MZ yet. They only have pic32mx modules. I emailed MikroE and asked them if they plan on offering a pic32mz in the future. Still awaiting the reply. MikroElectronica informed me that they won't be supporting the PIC32MZ. The reason they gave is that the chip is too full of Errata, and they won't consider supporting the chip until Microchip fixes the bugs. 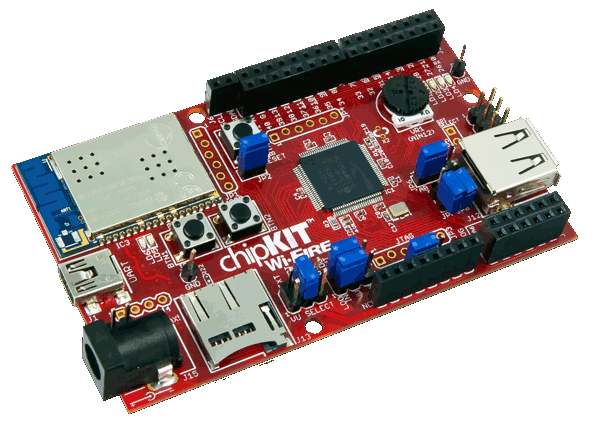 ChipKIT Wi-Fire is a good choice as well. Wi-Fi driver for LiteBSD is about 80% ready. I also ordered a new MZ board from Olimex: https://www.olimex.com/Products/PIC/Development/PIC32-HMZ144/open-source-hardware. We'll see how it goes. IMHO, people tend to overestimate the impact of MZ errata. In my experience, I had not yet encountered any of hardware issues with pic32mz. Everything I tried worked exactly as expected, including Ethernet. I never tried ADC and I2S though. It might be an underclocing to ie. 80MHz corrects many errata items.. I don't use underclocking, only standard 200MHz clock rate. So how do I get Matt to send me one of his units? I could send him a USPO Money order to avoid E-Bay stuff? Nice to see real hardware done by real people on this list . I don't have any at the moment. I haven't got round to re-designing the power subsystems yet - it needs a new EPS manifold, and the plasma relays are shot. I've got few spare beta-matrix compositors and a phase compensator (nos), if you may need them..
Also, I do not cross manifolds with replicator power converters, never. Btw, you may consider an isomagnetic EPS conduit in order to maximize the power distribution efficiency as well (I can supply too). The isomagnetic EPS conduit is a good idea - I may have to see if I can adapt the flow compressor to use them. No, and no Mr Fusion either. Dammit. My first order of business would be to find a DeLorean on ebay. Then, assemble the flux capacitor. The pic32mz would control the fuel injection system on the retrofitted V6 engine, as well as the 7-segment displays showing the destination years and times. So Matt, please consider my 'order' a backorder . And if I can help, please let me know how! As you already know, I have a few ideas which I won't bother you further with . Really nice to see your efforts getting close to product land. Fun journey! Good luck!! I spent most of my career doing products.